The Tiny Tots Department at IFC ministers to babies and toddlers from birth through age two. It is staffed by dedicated men and women who have a love in their hearts for each child and a desire to minister to their needs. We call our Primary Department “God’s Head Start Program” because our goal is to give children ages 3 through 6 a head start on their relationship with the Lord. This department has two classes – the Preschooler’s Class is for 3 and 4 year-olds and the Kindergarten Class is for 5 and 6 year-olds. Faith Island is a fun-filled tropical paradise for boys and girls in first through fourth grades. A typical day on the “Island” includes passing through Customs, enjoying drama, puppet skits, object lessons and games that the Island characters use to teach biblical truths. Our curriculum includes in-depth studies on subjects such as Christian foundations, prayer, divine healing, the gifts of the Spirit, spiritual growth, faith, walking in love and redemption. We also teach Bible-use skills and encourage the kids to learn a memory verse each week. 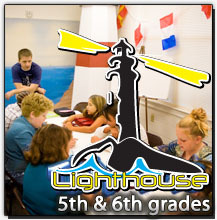 Our class for 5th and 6th graders meets every Sunday morning at 10:30 in the Education Building. We use a unique approach to Christian education called active learning. It’s busy, sometimes noisy, uses a variety of gizmos, gadgets and games, and the kids love it! Class work sends the kids right to their Bibles for answers to questions and problems facing today’s preteens. We serve a good God who has direction and instruction and promises for these kids, and we want them to learn to seek out and apply the Word to their lives. 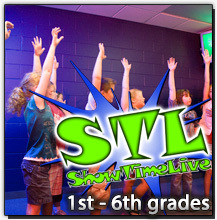 Every Wednesday night, at 7:30 p.m., kids in grades 1 – 6 attend ShowTime Live. It’s just over an hour of fun and games that help solidify the Word of God in their every day lives. Teams compete in a friendly atmosphere where each child is encouraged to do their best and no un-sportsman-like conduct is allowed. Games, stories and more games is what we use in ShowTime Live to teach and reinforce that evening’s Biblical truth. Your kids will love the gameshow-type atmosphere with all the bells and whistles!